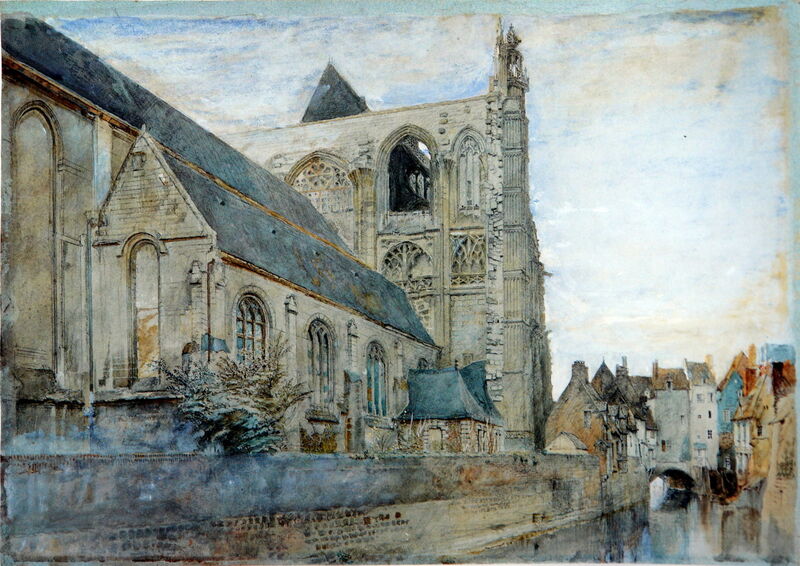 John Ruskin (1819–1900), Abbeville: Church of St Wulfran from the River (1868), pencil, watercolour and bodycolour, 34.3 x 50.2 cm, location not known. Wikimedia Commons. He published his first substantial writing on painting the following year, which was to become the first volume of his highly influential series Modern Painters. This appeared anonymously as the work of “a graduate of Oxford”, and its main purpose was to extol the aesthetics of current artists, particularly JMW Turner, as being comparable to those of the Old Masters. Its initial reception was mixed, but the support of prominent literary figures such as Charlotte Brontë and Elizabeth Gaskell ensured Ruskin’s success. 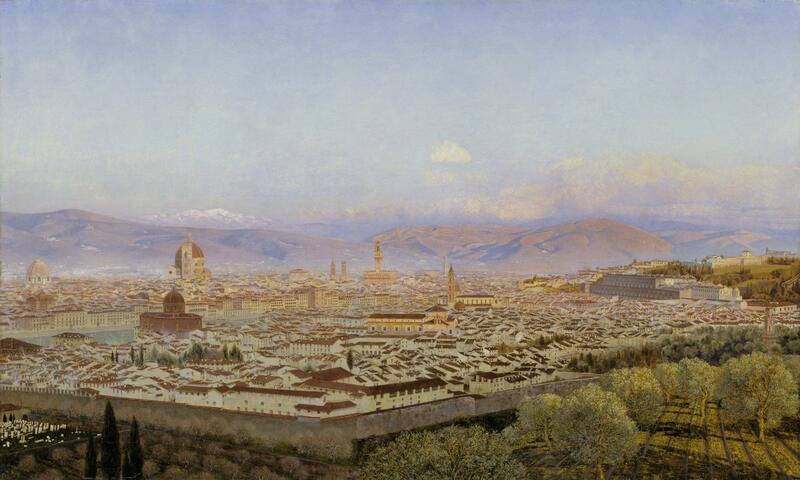 Across Europe, the nineteenth century saw a change in influence over art. Previously major external influences over painting were patrons and purchasers, and other painters through their guilds and societies. In the nineteenth century, people who were neither professional artists, nor those funding an artist, started to become important determinants of a painter’s career and success. 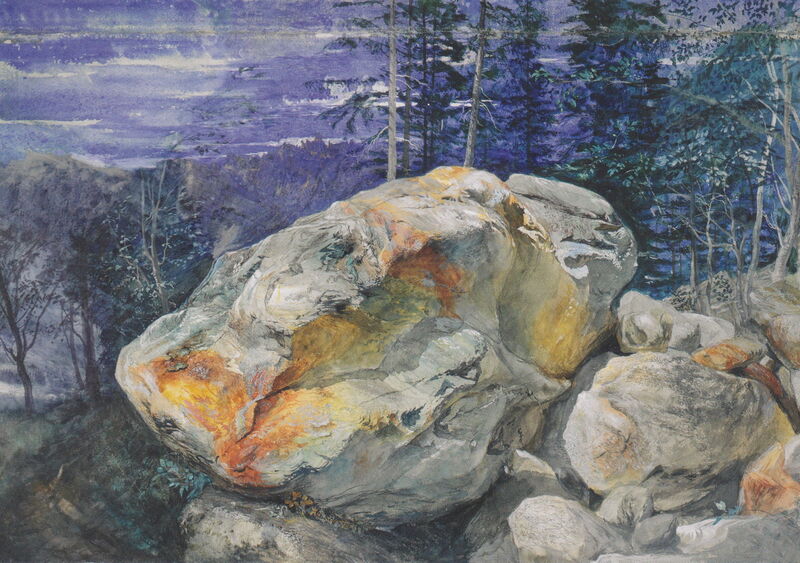 When the Pre-Raphaelite Brotherhood (PRB) formed in 1848, while its ideals were largely original, its emphasis on painting only from nature, and depicting nature in ‘true’ detail, were greatly influenced by Ruskin’s writing, although members of the PRB did not meet Ruskin for some time later. By that time, Ruskin had already criticised some of the early Pre-Raphaelite paintings. He sprung to their defence in 1851, writing to The Times newspaper in their support. Ruskin then became embroiled in the tumultuous personal lives of the members of the PRB – his own wife divorced him to marry John Millais – and from 1855 wrote an annual review of the key British exhibition at the Royal Academy. His opinions expressed in the latter made and destroyed reputations and careers. Although he gave considerable financial and critical support to several members of the Pre-Raphaelite movement, that proved as capricious as his critical opinions. Apparently for the first time in the history of art, a single critic who was not an experienced and knowledgeable practitioner in painting, was largely directing an avant garde movement. It would be grossly unfair, though, to dismiss Ruskin as not being an artist himself. He painted, and painted rather well. John Ruskin (1819–1900), Christ Church from St. Aldate’s, Oxford (1842), ink, crayon and watercolor over pencil, 32 x 47 cm, location not known. Wikimedia Commons. 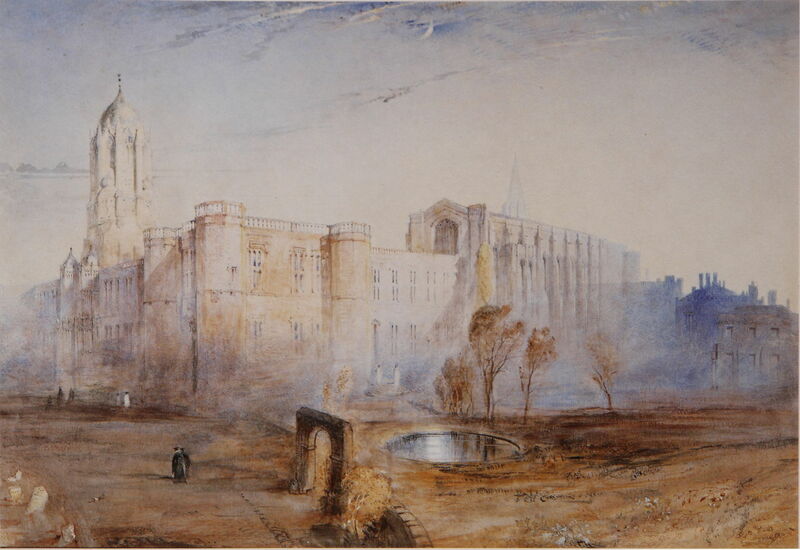 This view of his old college Christ Church from St. Aldate’s, Oxford painted in 1842 shows clear influence from Turner. 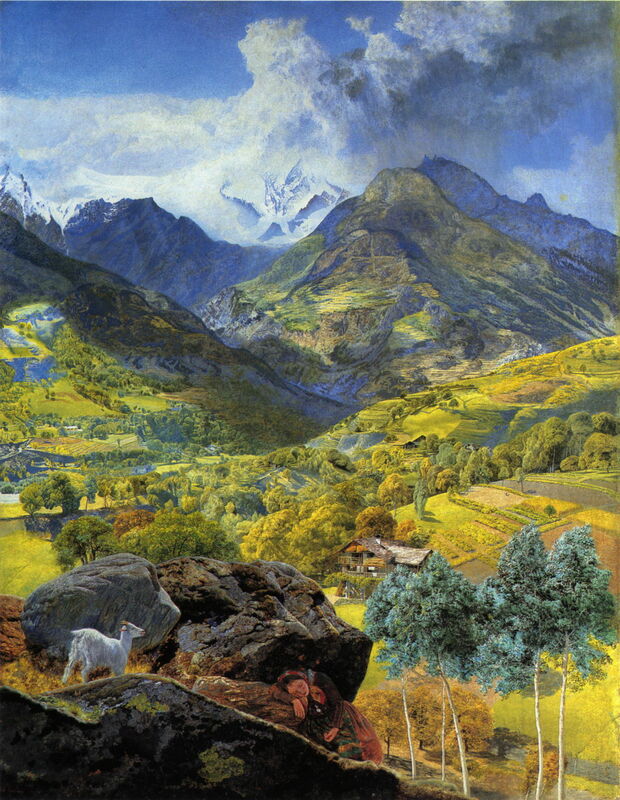 Fragment of the Alps made in 1854-56 is another of his more complete paintings. Sadly, many of his watercolours are sketches clearly intended as personal records rather than for others to view and read. 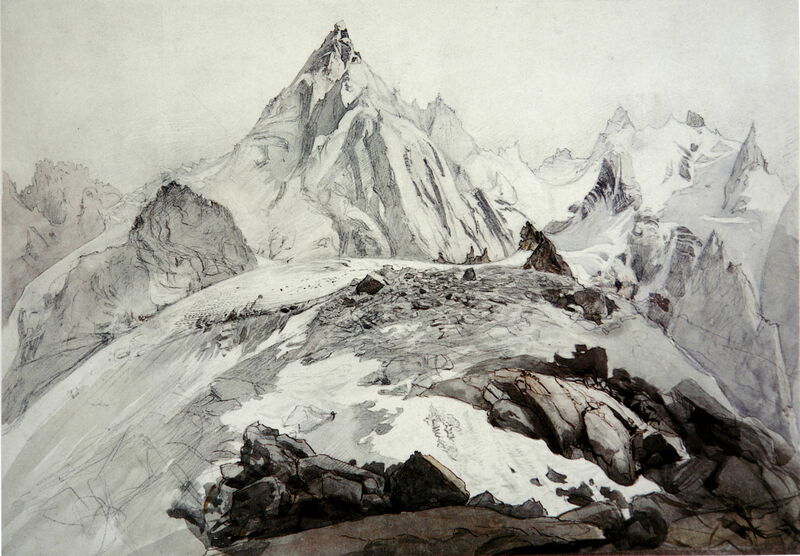 Ruskin painted extensively during his travels, and undertook summer painting campaigns in the Alps. The Aiguille Blaitière from about 1856 is one of the more complete of those works. He was an expert draftsman, as demonstrated in this view of Abbeville: Church of St Wulfran from the River from 1868. Perhaps his greatest achievements in visual art were the documentation of many of the architectural details of Venice. His writings and campaign to preserve those buildings helped rescue the city from centuries of neglect. However, Ruskin’s influence on British landscape painting was almost disastrous, largely because of his limited insight into the practicalities of painting. At that time, there was considerable experience in the practical issues involved in painting en plein air using oil paints, but most of that had been gained in the warmer and more stable weather of the Roman Campagna. None of the PRB, nor Ruskin, had any experience of that, nor did they seek the advice and guidance of those who did. Painters who had undergone classical training, such as Frederic, Lord Leighton, and Corot in France, had that experience, although Leighton didn’t return to Britain until 1859. Leighton continued to paint plein air oil sketches through his career. However, as they followed the classical tradition, as had Constable’s, they did not meet Ruskin’s precepts and the PRB’s derived principles for Pre-Raphaelite landscape painting. 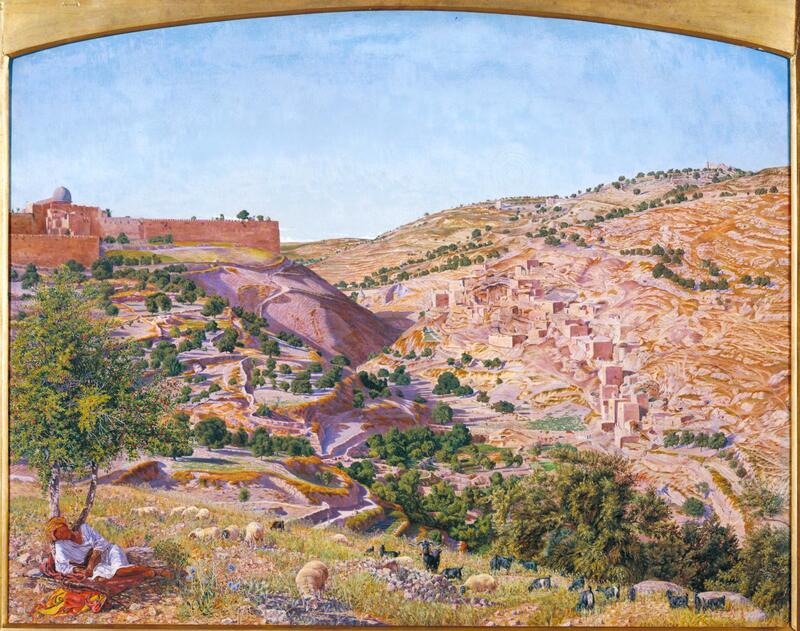 Thomas Seddon felt that Ruskin had been particularly pleased with this painting of Jerusalem and the Valley of Jehoshaphat from the Hill of Evil Counsel when he saw it in 1855, but by 1857 Ruskin was damning it with faint praise, implicitly putting Seddon in the ranks of “the prosaic Pre-Raphaelites”. Seddon had already died of dysentery in Cairo late in 1855. The fundamental problem for the Pre-Raphaelite landscape artist was the near-impossibility of the task posed by Ruskin, I am sure quite unwittingly. Painting substantial canvases in fine detail en plein air using oil paint is extremely time-consuming. In the more equitable and stable weather of the Mediterranean and Middle East, each painting is likely to take two months or more; in the more changeable climate of the British Isles, even a single summer may be insufficient. It is no small surprise, therefore, that most of those who painted landscapes in Pre-Raphaelite style did so for a short and relatively unproductive period, before moving on to less ambitious work. So by about 1870, after less than 25 years, the Pre-Raphaelite landscape was gone. Having started the century with two of the greatest landscape painters in Europe, Constable and Turner, by 1870 British landscape painting was all but dead. Compare this with the Impressionists over in France, who defied critics rather than being directed by them, built upon established traditions of painting, and were able to paint many thousands of works, and eventually achieve popularity and financial security. By comparison, Pre-Raphaelite landscape painting was bold, innovative, resulted in some paintings of extraordinary beauty and impressive technical achievement, but it was utterly impractical for anyone apart from the most obsessive amateur. John Ruskin died on 20 January 1900. Many of his achievements – including his campaign to save Venice – endure. 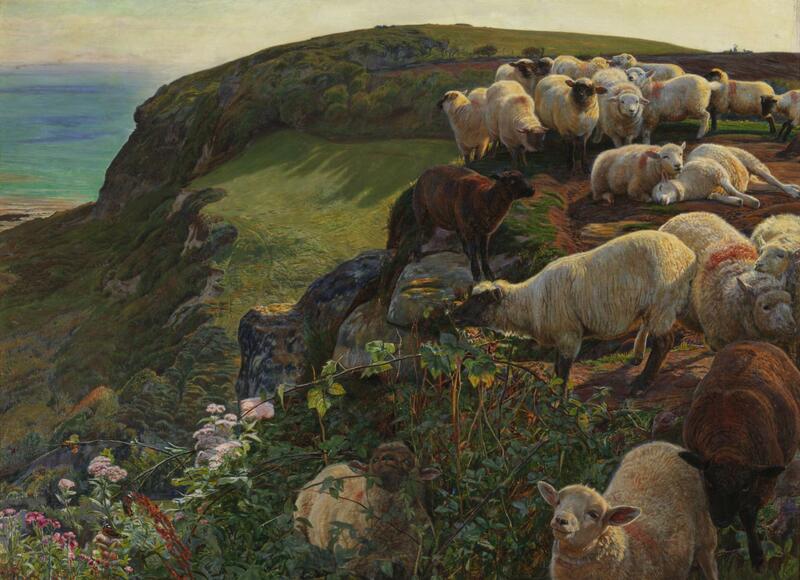 But his effect on British painting during the latter half of the nineteenth century was a mixed blessing, and British landscape painting didn’t really recover from Ruskinisation until well after Ruskin’s death. PDF texts of all his writings at the University of Lancaster’s Ruskin Library. Posted in General, Life, Painting and tagged Brett, critics, Hunt, painting, Pre-Raphaelite, Ruskin, Seddon, Turner, Venice. Bookmark the permalink.